Syed Razak's supporters and campaign workers getting emotional in the midst of the press conference. He said he would commission a poll, to be conducted by a non-political and independent pollster, to determine “my political fate with my voters”. “I think it is only right and fair to the voters for me to go back to them to find out if they are happy with my services as their assemblyman without having to wait for the full term. “I do not fear being rejected or sacked by the voters. 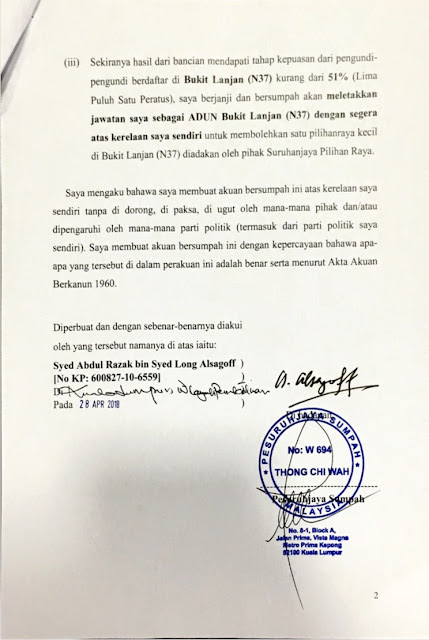 They are the ones who elected me and I must submit my report card. “If I am sincere, dedicated and committed to help raise the quality of life of the Bukit Lanjan folks, what’s there to fear facing my electorates. 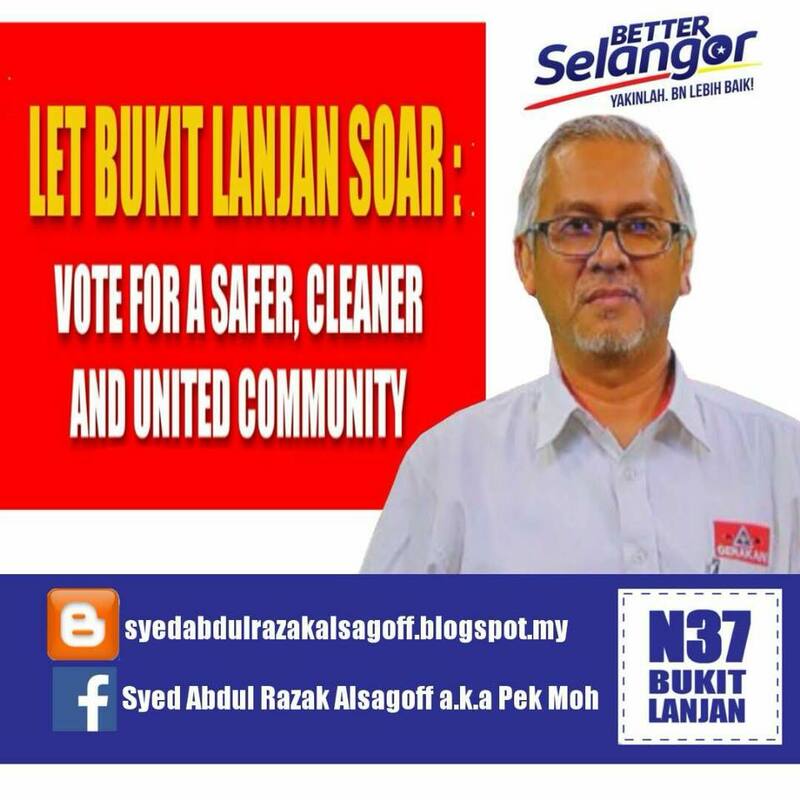 “I am making a serious promise to Bukit Lanjan voters. In fact, this motivates me, and gives me no room to play political hanky-panky. It is straight to work everyday, seven days a week. I will hit the ground running,” he added. At the press conference, Syed Razak a.k.a Pek Moh (white hair) of Bukit Lanjan, even shocked his campaign workers and supporters with his SD which he kept to himself. His supporters urged him to withdraw his SD, saying that it was too short a time to let the voters to fairly judge his performance. “Sorry, I hope we all work hard for a win. I am confident of delivering what I have set out to do for Bukit Lanjan because it is realistically doable. "I am a person who say what I mean, and I mean what I say. 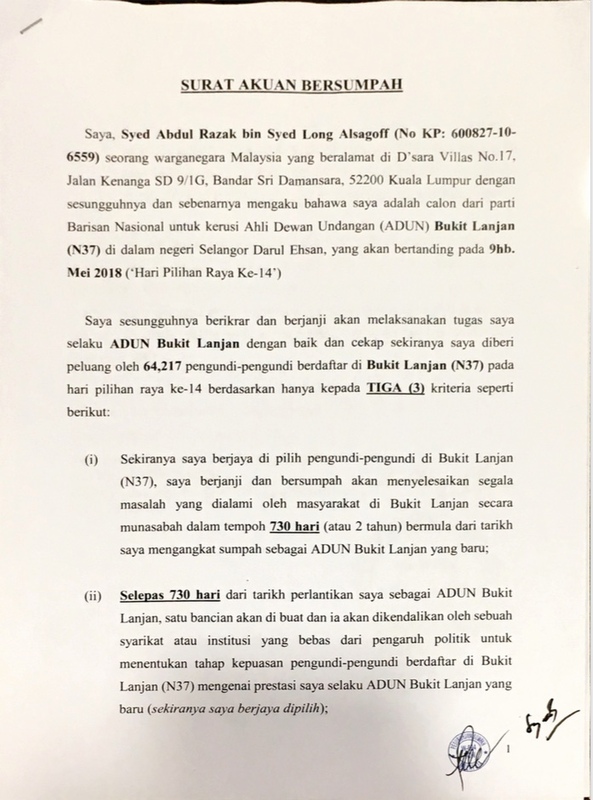 I will be serving my constituents with dedication to the service of Bukit Lanjan folks,” he added. 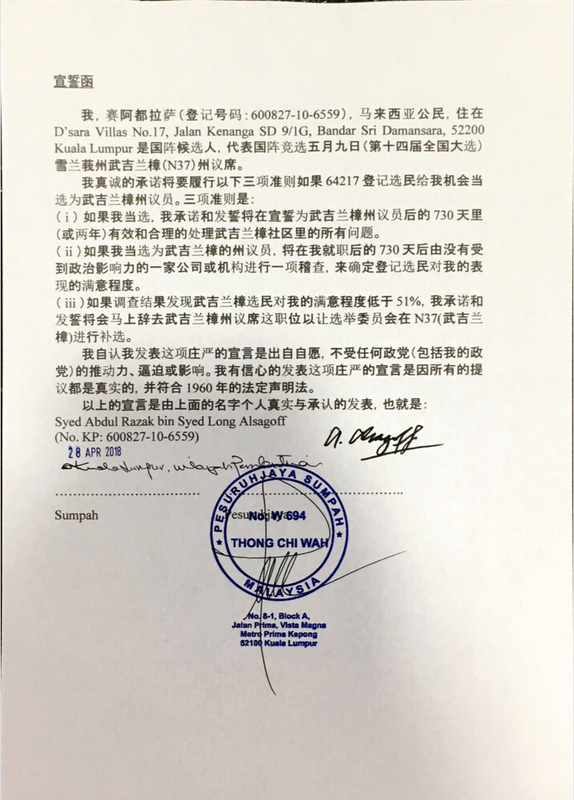 In a way, Syed Razak has set electoral history as a first Malaysian politician to commit political commitment of integrity in legal writing. Tuan Syed , if only other successfully elected representatives could take such an abeyance to a Statutory Declaration. In all fairness it's a short period to access your capability to deliver. Come what may you will certainly raise the bar. Most elected representatives are riding on the wave of their party's popularity ; sadly not up to mark. 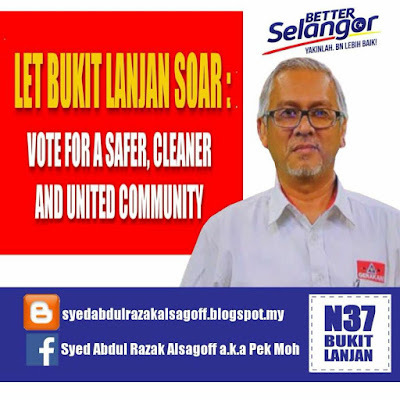 Bukit Lanjan consists of a mixed population and earning capacities , we all deserve the best attention. I , for one do not like a cookie cutter mechanism. Every request is individual in nature affecting thè community at large. Uplift society and it must be done. Best of Luck and Keep Steady.